Plan vacation or business trip with eTravel.com and take advantage of cheap rates on flights booking, airline tickets, and lowest airfares for Miami. 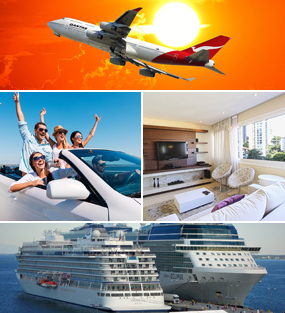 Search cheap flights to Miami, find and book single or multi-city destination flights. On this page we give you information and glimpse of visiting places in Miami, Florida, United States. Miami is a vibrant city located at the southern tip of Florida. The sun, sand and transcendent nightlife are the main highlights most people notice about the city. But within Miami there are little treasures waiting to be explored. Everything about Miami is energetic and fun. The art, the hotels, the glistening water and the wonderful people all come together to create a marvelous getaway from the high strung world. What is The Best Time to Visit Miami? You'd think summer time is absolutely delightful to cool off at the beach. But in Miami that’s the worst time to come to the city. Not only will you run into heavy tourist traffic, you'll also be bumping into the locals who’d like to enjoy the attractions of their own city. Spring time between March and May is the perfect time to run off to Miami. Everything is just starting to come alive during the spring. It is the beginning of the famous Miami sizzle and you don’t want to miss out on it. How to Save When on a Miami Tour? To get the best out your Miami vacations without having to break the bank, avoid the peak seasons. Travel around by public transport or rent a car during your trip. Experience the Cuban culture. The most memorable part at the end of your visit won’t be the beaches, but the cultural shock. So soak it up. Hit up all the free attractions like the beaches, parks and museums. You can also cut back on the hotel luxury because there are perfectly affordable rooms available in Miami that are plenty comfy.